2013-2014 Winter pool covers are a great way to keep your pool crystal clear during the upcoming off season! Installing the proper sized pool cover puts your mind at ease that your pool will be free of algae, debris and general wear and tear from this year's winter weather. 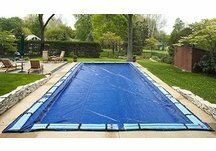 Pool Cover Source offers a variety of quality swimming pool covers to fit your budget. Our Solid Winter Pool Covers are available for round and oval above-ground pools, as well as rectangle in-ground pools. 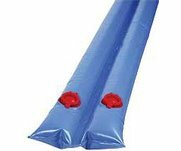 These swimming pool covers are made from tough polyethylene fabric with reinforced seams that won't rip, fray or come apart! 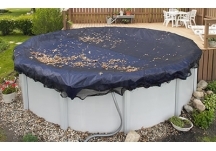 Our Mesh Winter Pool Covers are also available for round, oval and rectangle pools. The rugged mesh allows only rain water and very fine silt to pass through. 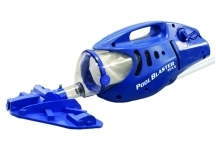 Simply lift the cover off in the spring, vacuum up the fine silt and open your pool! Keep your family safe with a Safety Pool Cover. Our safety pool covers are strong enough to support your entire family, yet light enough to put on or remove from your pool in five minutes or less. Arctic Armor covers are made of super-strong two-ply mesh with a break strength of over 4,000 lbs.